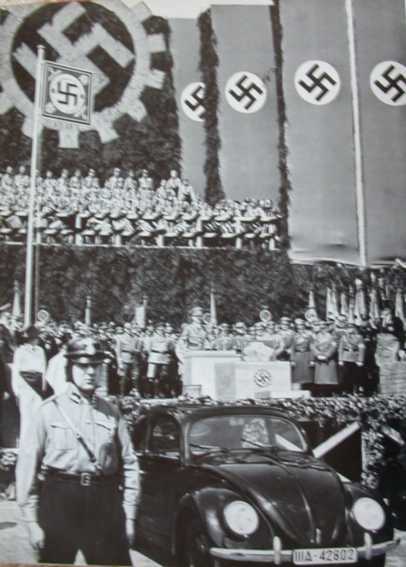 Background: The Volkswagen was a centerpiece of Nazism’s claims to benefit ordinary Germans. Hitler proposed to build a cheap car that almost anyone could afford. He gave it the name “KdF Wagen,” which we know as the Volkswagen. KdF was the abbreviation for “Kraft durch Freude" (Strength through Joy), a subsidiary of the Deutsche Arbeitsfront (German Labor Front), headed by Robert Ley. 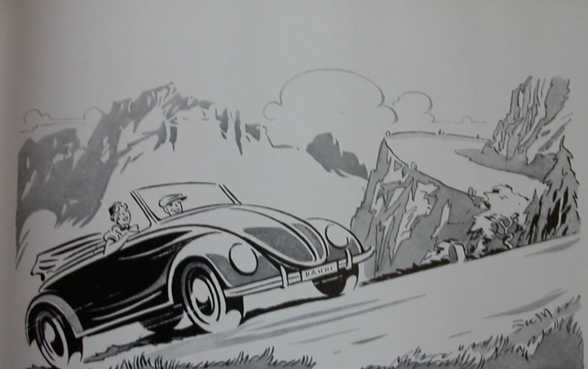 This chapter on the beginnings of the Volkswagen is taken from a book celebrating the achievements of “Kraft durch Freude.” As it turned out, not many people got their cars until after the war. As the chapter notes, the first deliveries were planned for early 1940, at which point the factory had been turned over to war production. I’ve included six of the ten illustrations in the chapter. The missing pictures show scenes of factory construction and happy Italian workers. The source: Unter dem Sonnenrad: Ein Buch von Kraft durch Freude (Berlin: Verlag der Deutschen Arbeitsfront, 1938), pp. 177-189. The enormous expansion of the German high system, particularly the Reich Autobahn system, which like the growth in automobile manufacturing came from the Führer’s orders, looked far into the future. Both projects go along with each other, and today hardly anyone does not cheerfully support Adolf Hitler’s work in these areas. The Führer’s will that the entire people should benefit from their common labors has repeatedly shown itself in recent years. It was only natural that it was always close to Hitler’s heart that this also include those with limited incomes. 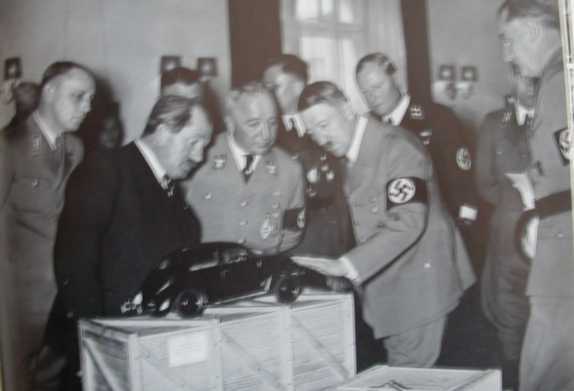 At the automobile exhibitions during the first years after the takeover of power, he so clearly expressed his wish for a Volkswagen that the automobile industry had to consider it an order or a commission. As is known, in recent years the German automobile industry was barely able to produce enough of its own models in a reasonably timely fashion, even when fully using all its labor, plants, and machines. It was thus no surprise that early in 1937 the Führer gave the leader of the German Labor Front the order to use all the means of his organization of millions of workers, along with the NS Community “Kraft durch Freude,” to realize his dream. As early as 1934, he had talked with the most famous German automotive engineer Dr. Porsche about carrying out his thinking, and given him the commission to undertake the construction of the German Volkswagen. 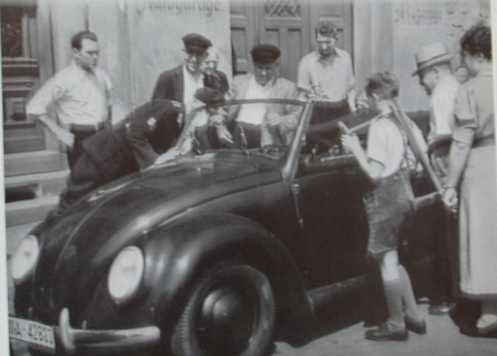 Early in May 1937, Dr. Ley carried out the Führer's commission to found the “Society for the Preparation of the German Volkswagen.” The manufacturer Dr. Porsche, the automotive expert J. Werlin, and the Reichsamtsleiter “Kraft durch Freude” Dr. Lafferentz were appointed the leaders of this organization. In a small miracle, an attractive car made of steel, powered by a 25 horsepower engine, and with enough room for four, even five, people, underwent hard testing. In 150,000 kilometers of test drives, it proved that it could easily maintain a speed of 100 kilometers per hour on the Autobahn. The test cars performed so well that it even astonished those who built them. Hardly any repairs were needed. In the mountains, the Volkswagen left larger cars behind, and also handled poor roads well. The right model had been developed. Now it was a matter of mass producing the car so that those with limited incomes could buy it, and of developing a means of financing it for them. One condition had already been met: it needed only seven liters of fuel for 100 kilometers. The significance of that figure is clear from this example: An adult pays 4 pfenning per kilometer for normal rail travel, which means a fare of 12 marks for three hundred kilometers, approximately the distance between Berlin and Hannover or Berlin and Hamburg. The new Volkswagen costs only 7 times 40 pfennig times 3, or 8.40 marks. If, for example, four workers share the fuel cost, each pays only 2.10 marks. Each saves 9.90 marks, or 39.60 marks in all. The new factory is being built on a 1.5 by 2 kilometer piece of land on the Mittelland Canal. 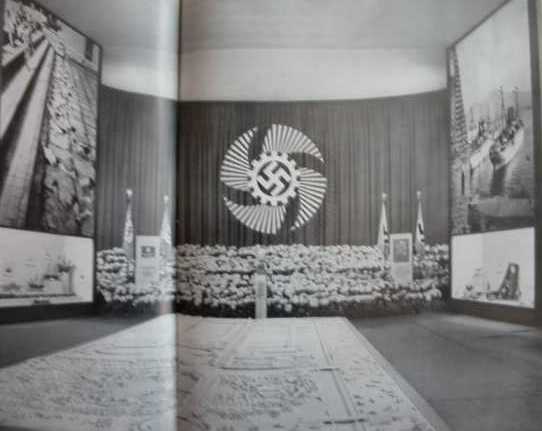 It is also near the intersection of two of the Autobahn.The Führer laid the cornerstone on 26 May 1938. Construction had begun several months earlier. The realization of his dream seemed certain, and so everyone understood it when the Führer recognized the achievements of the German free time organization by naming the car in his speech the “KdF Wagen,” a people’s car in the truest sense of the word. 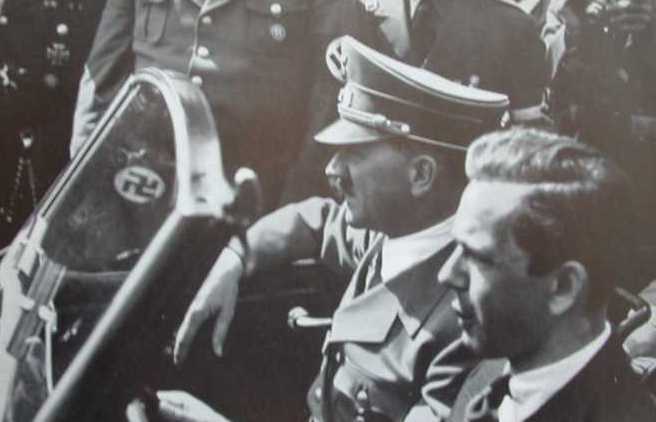 A storm of applause erupted as Adolf Hitler took a seat in a test car. The son of the designer took his seat behind the wheel and drove the Führer through the enthusiastic crowd of people. At present, 4,000 people are building the factory. Given the shortage of labor in Germany, 2,500 of them are Italian. They have quickly adjusted to the new conditions and win praise from all sides for their work. The number of workers will rise to 6,000. The workers are housed in barracks belonging to the Reich Labor Service. Married men receive a bonus of 1 mark per day. The food is excellent, and costs 1.16 mark per day. The men get .16 mark a day back when they leave, so that practically all their pay, or at least most of it, is available to their families. Housing, of course, is free, as is entrance to the community building, which can hold about 5,000 people. In this large room, there are daily movie, theater, and entertainment offerings. The KdF Wagen factory is being built in stages. Production began late in the summer of 1938. By the beginning of the last quarter of 1938, 150,000 people had already ordered the car and are waiting eagerly for delivery. They will begin receiving their cars early in 1940. After the first stage of construction is completed, two shifts will build 450,000 cars a year. That will rise to 1,350,000 KdF cars a year when the third stage is completed. Even in its first stage, the factory exceeds anything seen before in Europe. When its third stage is finished, it will significantly surpass Ford as the largest car manufacturing plant in the world. One thing about the project is entirely new: for the first time, a quality car will sell for under one thousand marks, and that almost everyone will be able to afford it. The entire world listened when it was announced that one could purchase the new car, and insurance, for 5 marks a week. In this world still ruled by liberal mercantile thinking, people did not notice that many will not be in a position to purchase the KdF car immediately will still be given preference through the installment payment system. At the beginning, it cannot be avoided that “rapid savers,” those people’s comrades who can pay more than 5 marks a week, will receive their cars first to ensure smooth deliveries. However, as soon as those saving 5 marks a week have paid the full price, they will immediately receive their cars, and those “rapid savers” who begin later will have to wait. Transportation is a measure of a rising standard of living. Long ago, many people could not afford railway tickets. Today, rail travel is something everyone can afford, just as they can afford streetcars and busses. Not long ago, millions with low pay could not afford the high price of a bicycle. Later, even a low-paid worker could afford a good bicycle. Millions of people in Germany still see a car as something only the rich can afford. Cars are no longer the privilege of a particular class, or of well-paid people, as is proven by the large number of vehicles in Germany today, above all those added since 1933. Time moves quickly. But never have things happened so quickly as in National Socialist Germany. In Fallersleben, a huge factory is being built. In less than six months, a million cubic meters of soil have been moved, and each day 500 tons of cement must be delivered by a pipe system to the proper place. We are at the start of a new era. In a few years, hundreds of thousands of workers and lower-level employees will own their own car, and in the foreseeable future millions of KdF cars will travel the best roads in the world, evidence of the accomplishments of a new Germany. Hundreds of thousands of people’s comrades, above all those who live in big cities and in drab industrial areas and who lead a joyless, colorless life, will now be able to reach the beauties of nature on weekends or after work with their families. They will find pleasure and relaxation. They will feel more like free and independent people. To own a car means to live twice as much!